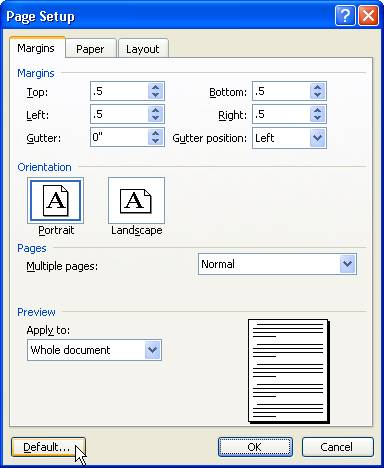 You can easily change the default margins to come up the same each time you start a new document in Word 2003 by choosing File-Page Setup-Margins. Here you can adjust your margins how you would like them to be and click the default button at the bottom. Click yes to allow the change. In the ribbon, click the Page Layout tab. Click the Margins tool in the Page Setup group. Change your right and left margins to one inch (or whatever setting you need). Everyone has individual preferences for how they like their Microsoft Word documents to look on their screen while working. Some people really like the Reading Layout feature in Microsoft Word (why else would they send you documents that use this by default?). Other people dislike it when Word opens up this way, and they find themselves racing to hit the escape key when this happens. 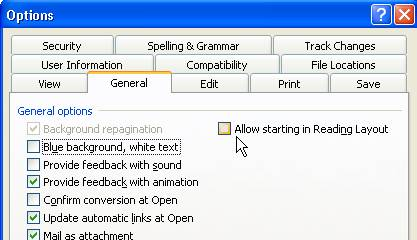 If you really do not like the reading Layout, you can ask Microsoft Word to not open any documents in that view by choosing Tools-Options-General and un-checking the box next to “Allow starting in Reading layout”. Other layouts can be trickier. 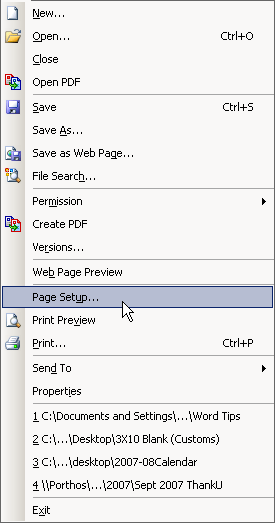 There are options for Normal, Web, Print, Reading and Outline on the View menu. If you choose one of these options for your document, you can then save it and it will always open this way. If you receive a document from someone else, you can change the view while you have it open, however the default view when you open the original will always be however it was created as this is saved with the document information.